The sun came out, and we all grabbed our cameras!!!! This is our neighborhood inside our wall. How we 'uns here in China dry our clothes. One thing I have yet to experience here is a breeze. I just realized that!! Pay Day!!!! Even teaching serfs get paid after all! It was such a hefty wad that my first impulse was, "Geez! Now I can buy Boardwalk and put a house on Ventnor!" We have learned to feel for the ridges on Chairman Mao's collar to detect counterfeit bills. For 32 cents we can take a jolly bus to see the largest panda preserve in the world here! It was GREAT! We saw about 40 pandas. And Americans too! Real Americans!! "Pre-adults" or so said the sign. I can spot shenanigans anywhere! No need for signs! Teen agers!!!! And a teaser. Next time--What we eat, how we cook it, how we eat it, and where we buy it. We will discreetly omit any information about where that food comes from (although we have our suspicions...). That settles it. I need a panda in my life. 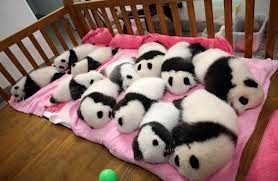 Look at all the baby pandas! So adorable! "Round Round, Get Around, I Get Around!"